Over at The Name Station, there was a wonderful post on Hawaiian Names. Whenever I think of Hawaii, I tend to think of great beaches, lush foliage, the hula and floral print shirts. But there is one other thing, due to my love of history that I think of and that is the Hawaiian Monarchy. I will honestly admit that I do not know that much on the former monarchy of Hawaii but thanks to a wonderful book I have (Queen, Empress Consort: 50 Women Rulers From the Queen of Sheba to Catherine The Great) I have learnt about the last Queen of Hawaii, Lili’uokalani. Lili’uokalani (pronounced: lili-oo-kuh-lawn-ee) is a name of Hawaiian origin and means ‘smarting of the high-born one’. The historical Lili’uokalani was given the name because at the time of her birth, a relative was suffering from an eye-pain. This would not be the number one reason I would go about naming a child but she was one of fifteen children so they probably had to go about being inventive when picking a name out for a child. Lili’uokalani was actually born Lydia Liliʻu Loloku Walania Wewehi Kamakaʻeha but was also known as Lydia Kamakaʻeha Pākī and Lydia K. Dominis after her marriage. She is famous for being the only Queen Regnant of Hawaii and the last monarch. 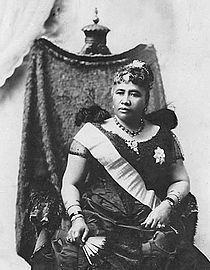 She was Queen for just less than two years, abdicating after the failed Counter-Revolution of Hawaii in 1895, this was when Hawaii became a Republic and a protectorate of the United States. As a staunch monarchist, she never stopped until her death in 1917 trying to restore the monarchy and whilst you may not agree with monarchy (maybe you do) but I think that strength is admirable. She was also a talented musician and composed numerous songs. One of her most famous is ‘Aloha Oe’ (Farewell To Thee) written in 1898. Lili’uokalani can also be spelt without the apostrophe, simply Liliuokalani and this version was given to 6 babies in 2011. I think that is nice that the name is being used though I doubt to see it rocket up the charts. It is a Hawaiian name that is distinctly Hawaiian and would probably best be used if you have Hawaiian heritage. Liliuokalani is a bit of a mouthful, but rather lovely. It would make for a pretty first name with perhaps the nicknames Lili or Kalani, and it would be a great way to honour a Hawaiian heritage. She seems like a really interesting character, too, which makes her name even more appealing. Thanks for the shout out! Great posts!